One of the worst things about going to the beach is the imminent sunburn. While lounging on the beach while the children play can be superbly relaxing, one long day on the beach can result in a bad sunburn that can keep you inside the house or hotel for days following. While sunscreen can protect you from this outcome, it can be substantially difficult to remember to apply it as often as you’re supposed to. Plus, the sun is hot! Depending on what beach you’re at exactly, and what time of the year it is, it can be nearly impossible to stay at the beach all day due to the heat. Luckily, there is a product that can tackle both of these problems – a beach umbrella. The BEACHBUB All-In-One Beach Umbrella System is easily the best beach umbrella on the market. It is incredibly durable and has an immense amount of staying power, but setting it up and transporting it is not difficult. Plus, it comes with a 3-year protection plan. It is difficult to find an umbrella that has a decent sized top, but that won’t fly away at the slightest breeze. Those that do have any sort of staying-power require immense amounts of set up that usually involves a lot of digging and fiddling with difficult anchors. The amount of set up required usually turns customers off of using the umbrella all together, which leaves us right where we started – hot and sunburned. However, the BEACHBUB All-In-One Beach Umbrella System is different. 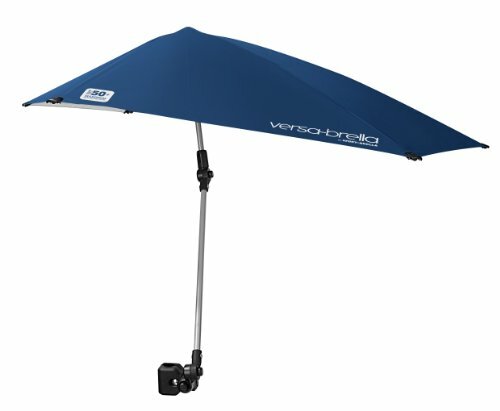 This umbrella features a unique anchoring system that is both effective and easy to set up. It is even endorsed by the American Lifeguard Association for its effectivity. The ALA is always concerned about the risk of flying umbrellas, which can cause great injury and be extremely hard to predict due to the variable coastal winds. They believe that this umbrella can reduce the risk of flying umbrella injuries. This umbrella is wind tested up to 35 mph, speaking to its extreme durability and staying power. However, this does durability does not mean that it is extremely heavy or hard to move. In fact, it comes with a transport bag that makes it extremely easy to take it to the beach and pack it up when you’re done. Plus, it comes with a 3-year protection plan that covers both losing the umbrella and breaking it. When it comes to beach umbrellas, usually the bigger, the better. After all, the larger the umbrella is, the most shade it will produce and the less likely you’ll get sunburned. However, large usually also means harder to transport and set up. Larger umbrellas are simply heavy, which can make dragging them from the hotel room to the beach difficult. However, there is one umbrella that is both large and easy to transport – the Tommy Bahama Sand Anchor 7 feet Beach Umbrella. This umbrella is aluminum with fiberglass ribs, making it light yet sturdy. Its telescopic pole means that is can transfer into a smaller size quite easily, which can help with transportation. Plus, it can be completely broken down into two parts and comes with a carry case to make everything easy to carry together. To make set up even easier, it comes with a built-in anchor. Now, you don’t have to buy an anchor separately or fiddle with trying to attach the anchor to the pole when all you want to do is lounge on the beach. Customers love that the umbrella features a silver lining for extra sun protection, further preventing sunburns and protecting your skin from the sun’s harsh rays. A beach vacation is expensive, and the last thing most people want to do is spend even more money on an umbrella. In fact, many beachgoers will avoid buying a beach umbrella altogether simply because they believe that they can’t buy a decent one at a good price. While it is harder to find a beach umbrella that is both high-quality and has a lower price, the AMMSUN 6.5 ft Outdoor Patio Beach Umbrella fits this niche well. It is extremely affordable, especially compared to other high-quality umbrellas, but it also comes equipped with many important features that are simply a must-have for beach umbrellas. It has an air vent in the top of the umbrella that prevents it from catching the wind and flying into the air, providing more stability and ensuring flying-umbrella injuries do not occur. It is made out of high-quality Oxford fabric with an aluminum undercoating that allows it to block many of the sun’s harmful rays. This feature both keeps the umbrella from breaking and prevents sunburn. The pole and ribs are made out of steel, providing maximum durability and strength. Plus, unlike many beach umbrellas, this one comes with a tilt feature that allows you to choose where you want the shade casts. This is extremely helpful if you spend long days at the beach and expect the sun to move overhead quite a bit. Canopy umbrellas are a whole different ballgame when compared to other beach umbrellas. These umbrellas lay directly onto the ground, with one side open so that you can lay under it. This makes them a perfect option if you have small children. While full beach-shelters are available, it is nearly impossible to convince a toddler or small child to stay in them. If you have a young child that is mobile, you know that trying to get them to stay inside a shelter and forgo the sand and ocean is just not going to happen. Canopy umbrellas, then, are a great middle ground. They provide lots of shade while still allowing your children to be part of the option. Plus, they allow the adults to rest underneath them without having to worry about shifting it every hour or two. It is a full 3060 degrees of protection. Out of all the canopy beach umbrellas on the market, the Sport-Brella Portable All-Weather Sun Umbrella stood out as the best on the market. If you’re planning on shopping or going out to eat while you’re at the beach, we further recommend purchasing an umbrella stroller to keep your child cool while you’re out and about. This canopy umbrella provides UPF 50+ protection, preventing sunburn and protecting your skin from the rays of the sun. The outside layer of the umbrella is made with 210 D Polyester, which allows it to withstand even the rugged conditions of flying sand and bright sun commonly found on the beach. To prevent the underside of the umbrella from getting hot, it features zip windows for circulation when you need it and shade when you don’t. Children will love resting under its canopy, and you’ll love how easy it is to set up and enjoy. Even with their ability to fold up and transport easily, it can sometimes be very hard to lug a beach umbrella down to the sea-side. If you’re trying to round up a pack of kids or are already transporting lots of gear, a heavy beach umbrella is probably the last thing you want. Plus, not everyone plans on getting in the sand or needing much shade. A large beach umbrella in these circumstances can be overkill. If either of these situation sounds like you, you should look into the Sport-Brella Versa-Brella All Position Umbrella. This chair umbrella simply latches directly to your chair, making set up extremely easy and transportation effortless. In fact, this umbrella weighs less than 2 pounds. Nearly everyone will find taking this small umbrella to the beach extremely easy. Despite its light weight and small size, it protects your skin from the sun just like every other beach umbrella, offering 50+ UPF protection and keeping your skin safe from UVA and UVB rays. A silver coating further prevents you from burning in the sun and helps protect your eyes as well. The clamp is extremely durable and was reported by customers to fit on nearly every chair, golf bag, or stroller. It connects to both square and tube-like structures, allowing it to fit nearly every outside chair. For transport purposes, it folds easily into a compact carrying case. Now, you can easily transport an umbrella that allows you to spend an hour at the beach without fear of a sunburn. Beaches are notoriously sunny and hot. After all, half the point of the beach is to enjoy the sun! However, this sun can come with some unseemly consequences, such as sunburn and heatstroke. While the beach is great fun, it is important to protect ourselves and our family from these conditions so that you can spend every day enjoying the beach. No one wants to get burned on their first day of vacation and have to spend every other day indoors and out of the sun’s rays. While sunscreen and liquids can go a long way in preventing these things, beach umbrellas can also help substantially. It is easy to forget to reapply sunscreen or drink plenty of water while you’re having fun at the beach, but once you get it set up, you can forget about the beach umbrella completely and simply allow it to block the sun. It doesn’t require constant reapplying and refilling, making it a wonderful passive way to block the sun’s rays. UPF protection. It is important for a beach umbrella to protect you from all the rays of the sun, including UVA and UVB rays. If it doesn’t, you have a clear hole in your protection and will not be protected fully while you’re at the beach. While every umbrella will protect you at least a little bit, those with silver or aluminum coatings will provide extra protection that will keep you healthy in the long run. Ease of transportation. There isn’t much point in having a beach umbrella if you can’t even get it to the beach, to begin with. By their nature, beach umbrellas tend to be big and bulky. Because of this, it is important that the umbrella you choose to purchase folds up or disassembles in some manner so that you can transport it easier. No one wants to have to carry a fully constructed umbrella to the beach. Set up. 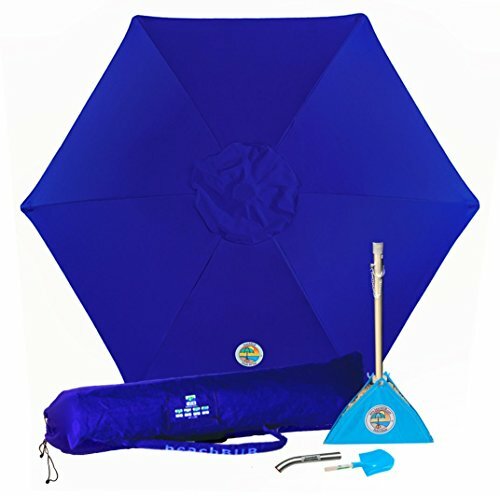 Once you get the umbrella to the beach, you want to be able to set it up easily. You’re at the beach to relax and enjoy your time there, not spend thirty minutes digging holes and setting up beach umbrellas. We recommend carefully research any beach umbrella’s set up before purchasing it to ensure that you won’t be wasting money on an umbrella you won’t ever actually want to us. The customer reviews are extremely good for this. Or, you could simply purchase one of the umbrellas on our top five list, which have all been vetted already. Durability. Beach umbrellas are regularly exposed to tiny abrasive particles and harsh sunlight, not a good combination for long lasting durability. Because of this, it is extremely important for a beach umbrella too be made out of high-quality materials. Before purchasing an umbrella, you should ensure that it’s pole, ribs, and the cover is all made out of a durable, functional material. Venting. While air vents are great for keeping the area under the tent circulating, they are also important to prevent the umbrella from catching in the wind and flying around. Without air vents, breezes and gusts will have nowhere to go, but up. This commonly causes umbrellas to fly, which can lead to serious injury. Before purchasing an umbrella, ensure that it has at least one air vent to allow incoming wind to escape. Does a beach umbrella offer SPF protection? Your average beach umbrella will not provide much SPF protection. For that, you will need sunscreen or an umbrella that has either an aluminum or silver coating. Otherwise, the sun’s rays will easily be able to pass through the umbrella’s fabric, and you might still end up with a sunburn the next day. We recommend purchasing an umbrella with one of these coatings and always wearing sunscreen. How do you anchor a beach umbrella in the sand? Anchoring a beach umbrella is extremely important. An improperly anchors umbrella can come loose and fly away with a moderate gust of wind and can seriously injure beachgoers. In order to anchor a beach umbrella, you will need an umbrella anchor specifically designed for the beach. Some beach umbrellas come with their own high-quality anchors, such as our top pick. But for other umbrellas, you will have to purchase them separately. How exactly the anchor is installed differs between brands. Some are required to be shoved into the ground, while others work as weights filled with sand. We generally recommend the later type, which you can view by clicking on our top pick. Weight-bag style anchors are simply easier to install and have less user error than those that must be shoved into the ground. What does a telescopic umbrella do? A telescopic umbrella is one that collapses into itself, which allows it to become shorter. This is extremely useful for umbrellas that are long, such as those used at the beach. It can be incredibly difficult to carry a long umbrella pole, so having one that can telescope into itself can be useful. What is a vented beach umbrella? A vented beach umbrella is one that has one or more air vents. These allow the wind to flow through the umbrella and prevent the umbrella from flying away. Plus, they also help keep the area under the umbrella circulating, which can really help in the heat! We also reviewed 20 other umbrellas for the beach. Even though these didn’t make our 5 best beach umbrellas list, they’re still the best of the rest, and each is still a great option. The information you’ll need to compare each one is included with the listing. This umbrella offers three-way tilt for better shade, no matter what time of day you’re relaxing on the beach. All these years you have gone without an umbrella on your vacations to the beach. You know you need one but never could find the right one. Fortunately, the California Umbrella will provide lots of shade. When it comes to hiding from the sun on the beach, you want something that will provide just enough shade with the durability to last. This umbrella boasts outdoor-rated polyester fabric and an aluminum frame that holds up to repeated beach outings. 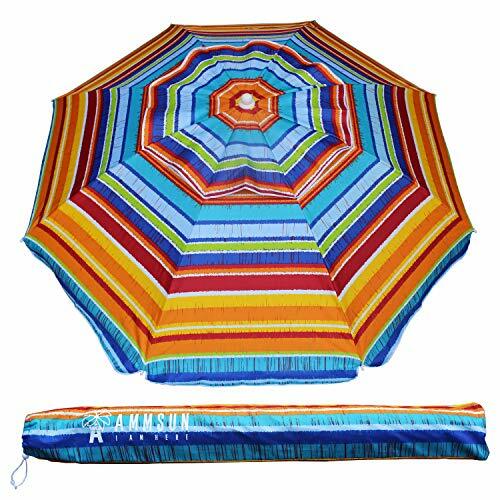 This all position umbrella will be the perfect item to bring with you to the beach. It provides loads of shade and blocks 99.5% of harmful UV rays. Having a portable umbrella can save your skin from the scorching sun. This durable and easy-to-carry beach umbrella offers an ample five feet of shade. Having an easily transportable umbrella is always a lifesaver when you’re heading to the beach. 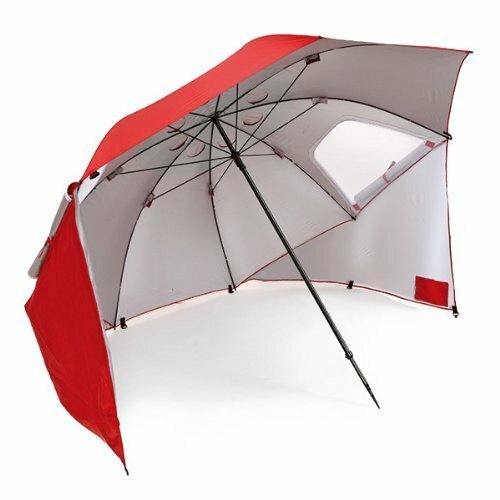 This ultimate sun-blocking umbrella is perfect for those who are prone to sunburns. Have you been searching for a cute beach chair for your little boy? The MHNCO for Kids is the perfect fit, with an umbrella for added protection from the sun’s harsh rays. If you have ever found yourself needing an easy-to-carry chair with an umbrella, then take a second to look at the Quik Shade Max. This chair is exactly what you need to relax and get away from the shade. With a cup holder and an umbrella, what more could you ask for? Do you have kids? Do you take them to the beach? If you answered yes to both of those questions, then the Redmon Kids Umbrella Chair is one to consider. Maybe you don’t want to purchase a chair with a built-in umbrella. If that sounds like you, consider this large umbrella with a 360-degree tilt mechanism that you can sit next to your favorite beach chair. If you are looking for a 3-in-one beach chair set, then this is just what you are looking for. This convenient portable double chair is perfect for couples who love to travel, especially the beach! This set offers two durable seats and a handy umbrella. This stylish umbrella comes in a fashionable orange color and has a built-in sand anchor. The perfect umbrella for anyone who likes to suntan. When you need or want shade then rotate the umbrella towards you; if you want to get your tan on, just turn it away. Stop worrying about your umbrella blowing away and buy the Impact Canopy Beach umbrella. It has an anchor on it that locks it down and keeps it in place on windy beach days. This is one massive beach umbrella that you definitely want to take a look at! It offers full UV protection and a 360-adjustment design. Sitting on the beach is one of the most relaxing experiences on earth. Getting sunburnt is not. This ample-sized, tilting beach umbrella will keep you shaded from the harsh sun. This umbrella is an “Amazon’s Choice” for a reason. The Titan is all around amazing, and you might have to upgrade from your current umbrella after taking a look at this one. 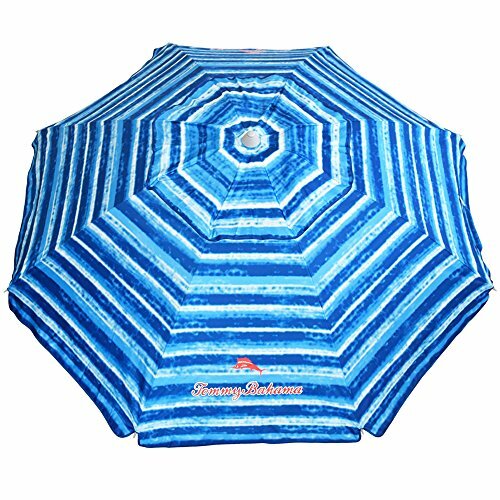 Needing a beach umbrella that offers a sand anchor and 100% UV protection? Look no further than the Yatio 7′ Beach Umbrella.